This Bird weighs four pounds and a half. The Head and part of the Neck red, bald and fleshy, like that of a Turky, beset thinly with black hairs; the Bill two inches and a half long, half cover'd with flesh; the end white, and hooked, like that of a Hawk, but without angles on the sides of the upper mandible. 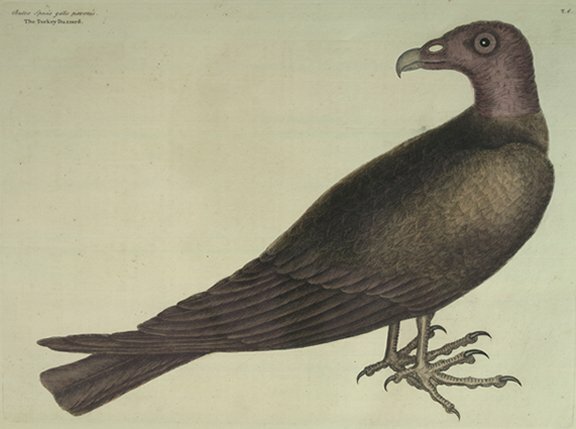 The Nostrils are remarkably large and open, situate at an unusual distance from the eyes: the Feathers of the whole body have a mixture of brown purple and green; the Legs short, of a flesh colour: their Toes are long-shaped, like those of Dunghil-fowls; their Claws black, and not so hooked as those of Hawks. Their Food is Carrion; in search after which they are always soaring in the air. They continue a long time on the wing, and with an easy swimming motion mount and fall, without any visible motion of their wings. A dead carcass will attract together great numbers of themem; and 'tis pleasant to observe their contentions in feeding. An Eagle sometimes presides at the Banquet, and makes them keep their distance while he satiates himself. These Birds have a wonderful sagacity in smelling: no sooner there is a beast dead, but they are seen approaching from all quarters of the air, wheeling about, and gradually descending and drawing nigh their prey, till at length they fall upon it. They are generally thought not to prey on any thing living, tho' I have known them kill Lambs; and Snakes are their usual food. Their custom is, to roost, many of 'em together, on tall dead Pine or Cypress-trees, and in the morning continue several hours on their roost, with their wings spread open: that the air, as I believe, may have the greater influence to purify their filthy carcasses. They are little apprehensive of danger, and will suffer a near approach, especially when they are eating.